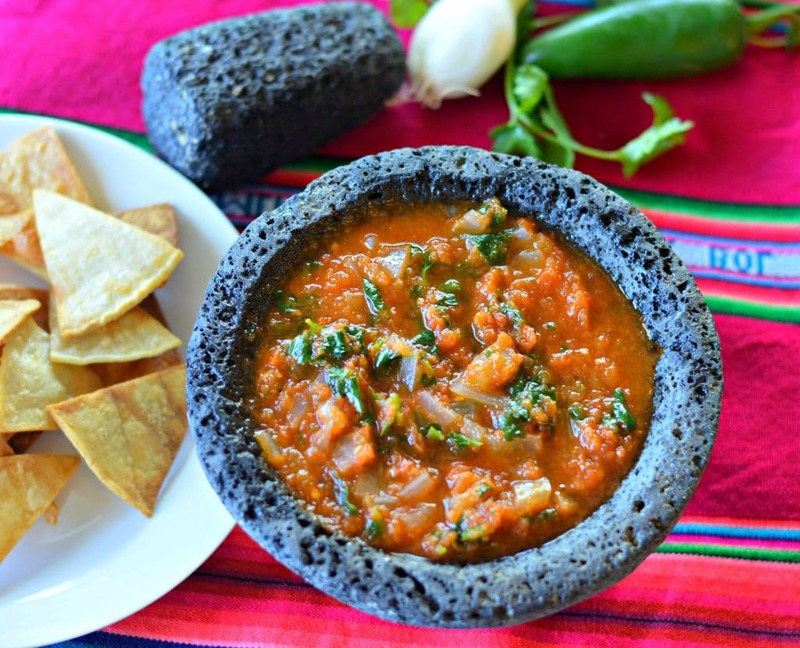 Salsa Recipe – Authentic Mexican Salsa Roja made with fresh ingredients is a perfect appetizer or snack to enjoy this summer. There are many different types of salsas in Mexican cuisine. That said, one of the most popular and well known is definitely salsa roja. It makes an appearance at almost every Mexican restaurant, and is almost always served with meals in Mexican homes. Today, I want to share my simple, fresh recipe for salsa roja that I learned to make while growing up in Mexico. 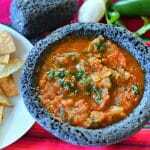 My mom always made this salsa roja recipe and served it with homemade tortilla chips and other recipes, like huevos rancheros. It is such a simple recipe, and it is better than anything that you can buy in the store. It includes fresh ingredients including tomatoes, onions, and cilantro and you won’t want to stop eating it once you stop. The good thing is that it is healthy, so you won’t feel so bad about indulging a little bit. Whenever I make this salsa roja for my family, we go through it in a hurry. It usually doesn’t last more than a day, but there have been a few times where we have used it a couple of times in the same week for different meals. I hope that you enjoy this salsa recipe as much as we do. Let me know in the comments below. 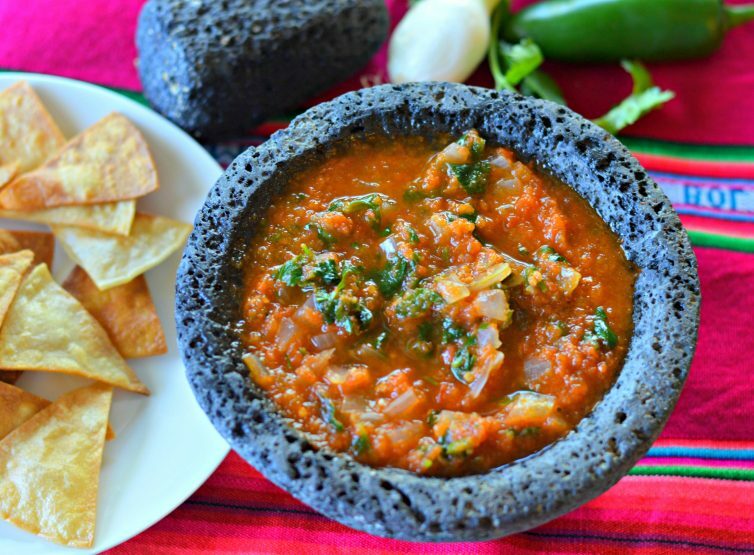 Salsa Recipe - Authentic Mexican Salsa Roja made with fresh ingredients is a perfect appetizer or snack to enjoy this summer. Blend the tomato, garlic, and jalapeno in a blender. Separately, dice the onions and the cilantro. Add the tomato, garlic, jalapeno mixture to a frying pan with a small amount of olive oil. Heat over medium high heat until it begins to boil, and then remove from heat. Put the salsa in a bowl, add the cilantro and onion, and stir well. This looks so good! About how much olive oil, though? Hi, Just stumbled across your site & I’d like to try making this salsa roja. Is there a particular type of tomato you recommend & do we use white onion? Hi! Sorry for the late response. I usually just use Roma Tomatoes, and yes – white onion is fine. You can also use yellow. Good luck! Hi can I please use this salsa for a Spanish recipe book project at my school? If I can, I need to know what state in mexico it originates from. thx. Yes – but please give credit to my website, by including a link to the recipe. Thanks! I am from Veracruz, Mexico. Good luck! Hey, I love how easy your recipe is! Question, typically do you throw in the tomatoes in the blender raw, roasted or steamed? I know many different people do it different ways, like my Madrina would roast them, I’ve read people who steam first, but which one is your favorite way to make? Hi Alejandra – for this particular recipe, I blend them raw with the jalapeno and garlic. For other salsa recipe, I prefer to roast them – I think it gives it better flavor. Thanks for the comment! Probably a stupid question but when you blend the tomatoes, Jalepeno and garlic do you actually properly blend it like a puree or just pulse until it’s chunky? It really depends on your own preference. I like for it to be a little bit more chunky, so I don’t puree it. You can do either option though and it will be tasty. Good luck! Oh my gosh I hit the gold mine when I came upon this website. I made fresh salsa verde tonight. Have you cooked it after making it fresh? Could I use a food processor instead of a blender? Or would the results be too different? I think that would work just fine for this recipe. I usually use a blender, but I think you should be okay using a food processor as well. Good luck! CAN THIS BE CANNED FOR FUTURE USE?